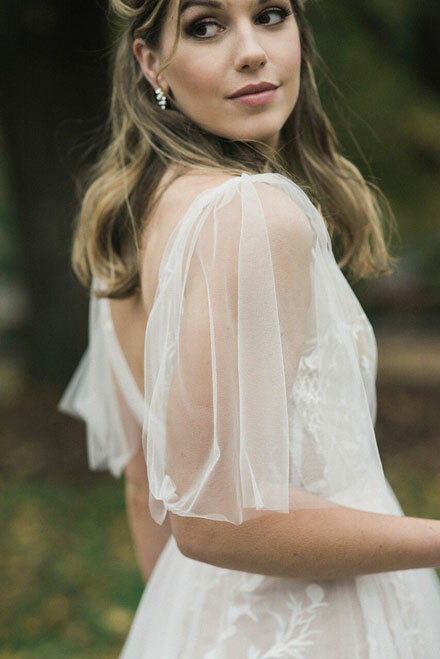 Wedding dresses with long sleeves. There are many good reasons for looking at long sleeve wedding dresses or a bridal gown with a strap. The first is they are extremely elegant and beautiful by design. Also, they can serve a purpose be it to cover that tattoo, it seemed like a good idea all those years ago. 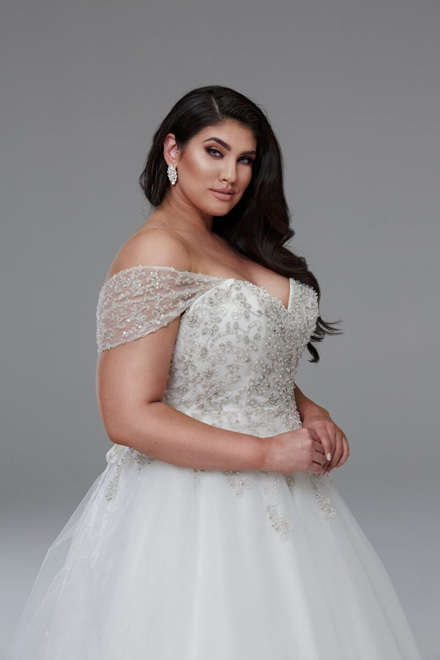 Possibly if your bra cup is over a DD a wedding gown with a strap or long sleeve will support your bust. Keeping your silhouette perfect all day. Or you just want your arms covered. You need to feel comfortable and confident on your day and know that you look amazing in the gown of your choice. 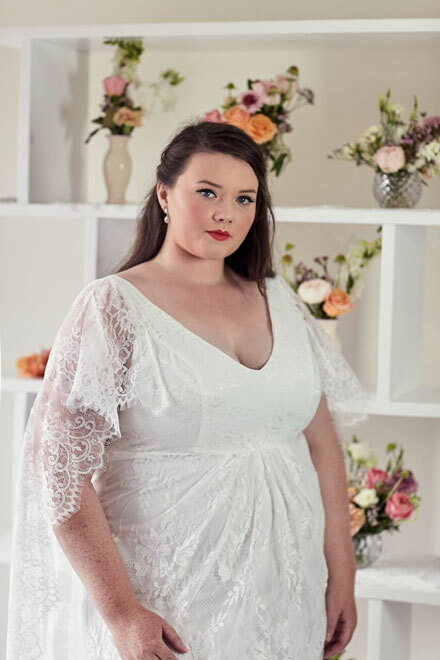 We recommend a more transparent fabric or lace for your plus size wedding dresses sleeve as a solid satin or opaque fabric is usually less flattering. 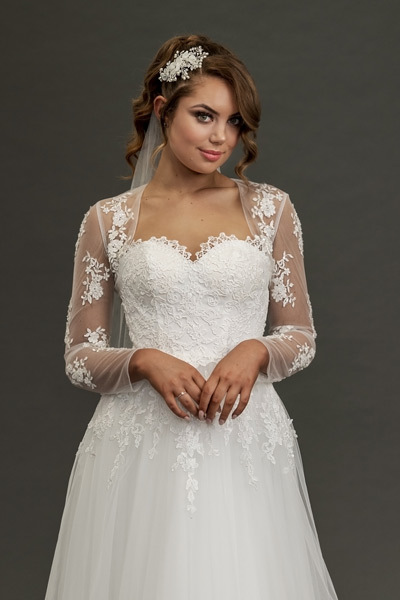 The fit of off the rack wedding dresses with sleeves is very important. The majority of us have one arm slightly bigger than the other also sometimes one foot is also bigger. In other words both halves of our bodies weren’t created evenly and that is what makes us interesting. However, usually a dress pattern is the same both sides and most of the time you wouldn’t notice it. But a fitted long sleeve is the exception to the rule. The last thing you want is to be uncomfortable all day because you have one sleeve tighter than the other. Leah S Designs have Ginger pins alterations on site to make sure all your bridal party dresses look and fit fantastically on your day. 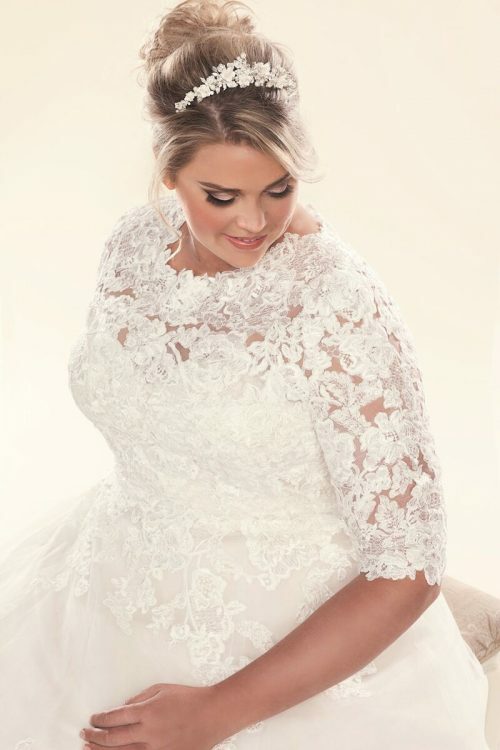 Lace bridal jackets and boleros. 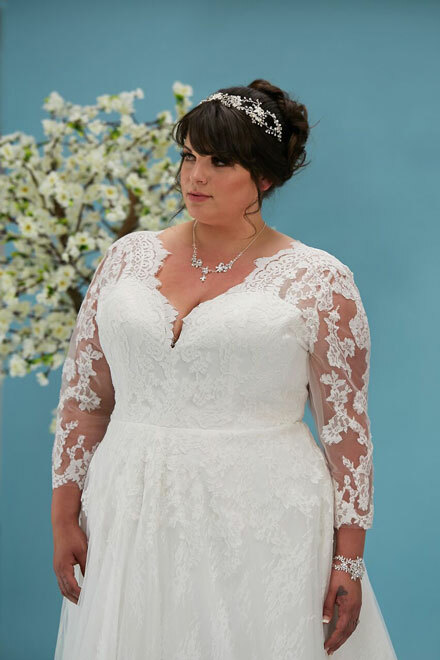 Have you thought of wearing a long sleeve bolero over a strapless gown? This will give you the luxury of two different looks for your bridal gown. 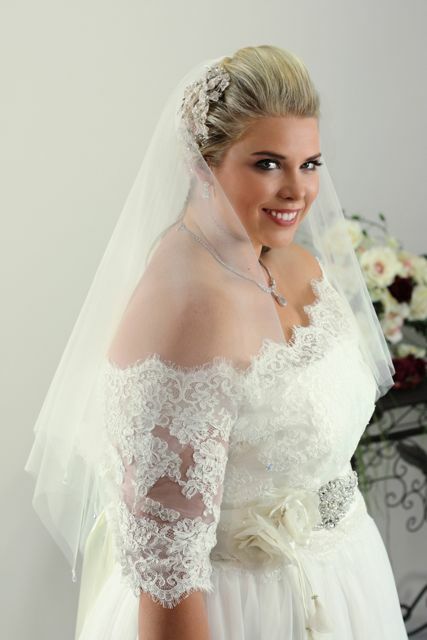 Our bridal shop has many off the rack lace boleros to choose from 3/4 or short sleeve. Boleros and lace jackets are a pretty addition to your outfit if you think the weather may be cold. There is nothing worse than a beach ceremony the sun is shining it’s a beautiful day but a cool breeze is blowing in from the water. Leaving you with your teeth chattering. 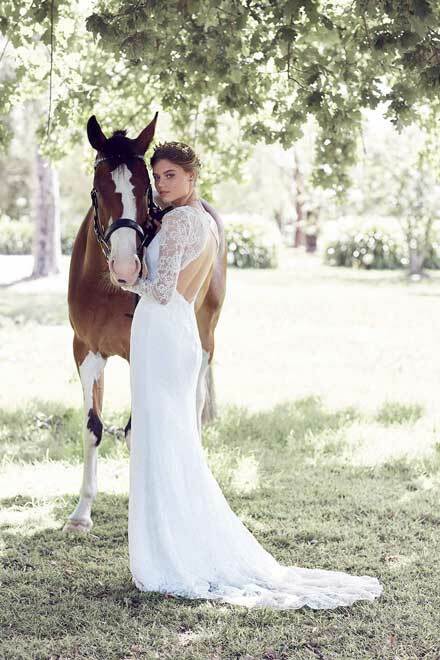 Simple gown styles are great for a more relaxed ceremony or a beach wedding. Possibly you are planning a church service and would like a modest respectful look for the ceremony. Whilst adding a royal feel. Remembering Princess Grace and her stunning classic gown. 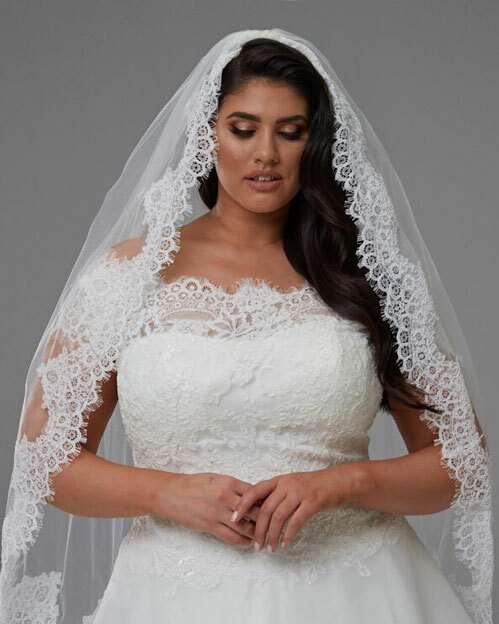 Choosing the right veil can provide extra arm coverage. Remember that where you place your veil in your bridal hair style will dictate where the veil falls. For instance worn under a bun, the veil will fall down your back. A forward placement will ensure it falls around your arms. Most long sleeve wedding dresses have the option of having the length of sleeve adjusted to short or 3/4 which ever style suits you best.